The Non-Invasive Cardiovascular Laboratories at Boston Medical Center offer state-of-the-art diagnostic testing for heart and vascular conditions such as arrhythmias, heart failure, coronary artery disease, carotid artery disease, congestive heart failure, hypertension, and more. Offered testing include Stress Testing, Echocardiography, Vascular Diagnostic Testing, and Advanced Cardiovascular Imaging. Each area is supervised by cardiovascular experts and staffed by highly skilled exercise physiologists, sonographers and technicians. To schedule an appointment or learn more information, please call 617.638.8745. The most common type of echocardiogram, this test uses ultrasound to obtain a still or moving image of the heart. This test uses ultrasound to make detailed images of the heart and the arteries leading to and from it. Unlike TTE, TEE requires a thin tube that passes through the mouth, down the throat and into the esophagus to obtain the clearest of images. A sedative is typically administered to keep the patient calm. TEE is commonly used to detect any abnormal tissue, blood clots, or how well the heart is pumping. This test involves the injection of medication called dobutamine, which stimulates the heart in the same way that exercise would. Typically used when a patient is unable to exercise on a treadmill or stationary bike, it can determine how well the heart tolerates activity, the likelihood of coronary artery disease, and evaluate the effectiveness of a treatment plan. A stress test is done to gather information about how the heart works during physical activity. Since exercise requires the heart to work hard and pump blood, the stress test can reveal otherwise unnoticeable problems with the heart or be used as a guide to further treatment if there has already been a diagnosis. When a patient comes in for a stress test they will be hooked up to special equipment used to monitor the heart, and asked to walk on a treadmill. As the test progresses, the speed and incline of the treadmill may increase, during which time breathing, heart rate, and blood pressure are all monitored. The test continues until the patients hear rate reaches a certain target or feels unable to continue. The patient is encouraged to stop the test at any time if they become too tired or uncomfortable. After a stress test, results will be sent to the patient’s cardiologist. The doctor will then discuss the results with the patient, and use them to create or modify a treatment plan. Vascular diagnostic testing is the processes of looking at a person’s blood flow. Oxygenated blood flows from the heart to the body through arteries, and once deoxygenated, is returned to the heart by veins. Arteries and veins make up a person’s venous, or vascular testing. A test to measure and compare the blood pressure in the arms and legs of in order to identify any blood flow problems. A painless examination using ultrasound to measure the size and blood flow of the abdominal aorta to determine if an aneurysm is present. This test is used to define circulation in the arteries. Arteries with and without blockages are evaluated, ultimately enabling the physician to prevent any future blockage in the patient. This test is used to determine whether plaque or other matter is blocking blood flow in the carotid arteries. An ultrasound is used to record the appearance and the amount of arterial blockage. With this insight, the physician can determine the best treatment for the patient. Typically ordered for patients with high blood pressure or who appear to be losing kidney function, this test uses ultrasound to determine if arteries leading to the kidneys are too narrow. This painless test uses ultrasound to examine the blood circulation within the brain. A small amount of gel substance is applied topically over the area to be examined. Then, a device called a transducer is held in place on the skin's surface, and blood flow information has been recorded. This painless test uses ultrasound to create a “map” of the veins, typically in the leg. This might be done in preparation for various procedures, like bypass graft surgery (replacing diseased vessels in the body with a healthy vein from the leg). BMC's Advanced Cardiac Imaging Program (ACIP) is a collaboration between the Section of Cardiovascular Medicine and the Department of Radiology. Working together, physicians bring expertise in cardiovascular patient care as well as in-depth knowledge of imaging techniques. This cooperative relationship is essential to the program's success. All studies are conducted by physicians with advanced training in cardiac MRI, cardiac CT, and/or cardiac PET/CT. Cardiac magnetic resonance imaging (MRI) uses a powerful magnetic field, radio waves and a computer to create a clear and concise image of a patient’s heart in motion, without using x-ray radiation. 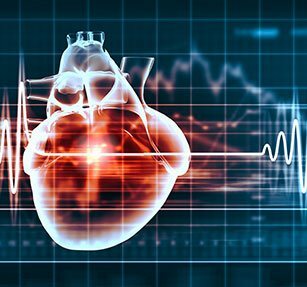 It is used to detect or monitor heart problems such as infections or inflammatory conditions, coronary artery disease, congenital heart disease, or to evaluate the effects of surgery. An MRI is also commonly used to clarify unclear findings from echocardiography. What can a patient expect during a cardiac MRI? Patients should know that a cardiac MRI is painless and harmless. The patient will be asked to remove any clothing jewelry, or other items that may interfere with the procedure. The MRI machine will be located in a special room that prevents radio waves from disrupting the machine. It also prevents the MRI machine's strong magnetic fields from disrupting other equipment. The patient will be asked to lie on their back on a sliding table and asked to stay as still as possible. The technician will control the machine from the next room and will be able to communicate with you through a microphone. Sometimes, a contrast agent is used – injected into a vein in the arm through a needle. This highlights the blood vessels or heart in the pictures. Cardiac MRI typically lasts between 30 and 90 minutes. Cardiac computed tomography (Cardiac CT) is an x-ray test that physicians use to take clear and detailed pictures of the heart. Cardiac CT is used to help detect or evaluate problems such as coronary heart disease, calcium buildup, pulmonary embolism, aneurysms, and dissections. It is sometimes used in patients who obtained unclear results from a previous stress test. Cardiac CT will likely not be used as a screening test in patients with no symptoms because of long-term radiation exposure concerns and lack of proven benefit. What can a patient expect during a cardiac CT? A Cardiac CT is a quick, painless test. An x-ray machine will move around the patient’s body in a circular motion, taking pictures of each part of the heart. Sometimes a contrast dye is used - injected into a vein in the arm through a needle. This highlights the coronary arteries on the x-ray pictures, and is typically referred to as a coronary CT angiography (CTA). Cardiac positron emission tomography (PET) is a nuclear imaging test that uses radioactive tracers to produce detailed pictures of the heart. PET scans are typically used to look for poor blood flow in the heart, to assess damage due to heart attack, or to diagnose coronary artery disease. A PET scan is also commonly used to clarify unclear findings from other heart tests, such as echocardiography or stress test. Unlike MRI and CT, a PET scan gives more information about how organs and tissues are working. What can a patient expect during a cardiac PET? The technician will begin by inserting an IV into the patient’s arm, through which a special dye with radioactive tracers is injected into the veins. Electrodes for an electrocardiogram (ECG) will be places on the chest to monitor the heart rate. Once the tracers are absorbed through the body (about one hour) the patient will be asked to lie very still on a table that glides slowly into the machine where the pictures will be taken. Once the need for a cardiac MRI, PET/CT, or CTA has been determined by a requesting clinician, pre-authorization is required from the patient's health insurance company. Upon receiving pre-authorization from the health insurance company, please contact the ACIP directly.